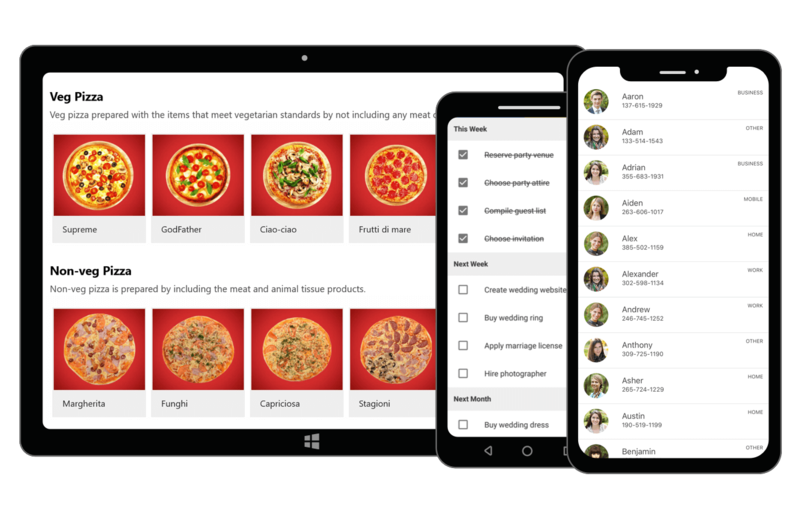 The Xamarin.Forms ListView control displays items in horizontal or vertical orientation. It supports all the essential features such as swiping, template selectors, pull-to-refresh, load more, reordering items, autofitting items, and much more. The Xamarin.Forms ListView control renders a set of data items in vertical or horizontal orientation on a linear or grid structure. Supports all essential features such as swiping, template selectors, horizontal and vertical orientations, pull-to-refresh, load more, reordering items, autofitting items, and much more. The control also supports sorting, grouping, and filtering with optimizations for working with large amounts of data. The ListView supports two different layouts: linear and grid. The linear layout arranges items in a single column, whereas the grid layout arranges items in a predefined number of columns. Both layouts are supported in horizontal listview. Data binding works out-of-the-box for the most popular data sources such as Lists, ObservableCollection, and much more. The ListView has built-in support to load data from data sources and supports sorting, grouping, and filtering out-of-the-box. Sorting - Sort items in ascending or descending order programmatically and in XAML. Custom sorting logic is also supported. Search items - Set predicates to easily filter items and view data as needed. Real-time updates - Automatically update the UI when adding new items and deleting items in the underlying collection. Update the sorting and grouping when changing business objects. Swiping - Associate swipe views with custom actions for each item. Swipe views are displayed by swiping from left to right or right to left over an item. Load more - Load more data at runtime either automatically or manually when reaching end of the list. You can also load more data manually at the top of the list. The ListView supports customizing the loading indicator and load more buttons. Built-in drag and drop - Reorder items by dragging them either with a long press or from the drag indicator view. ListView supports customizing item appearances while dragging. Selection - Built-in support for selection with single, multiple, and none select modes by tap, double-tap, and hold selection gestures. The selected items can also be customized by adding any view. Custom template - Host any view or control to customize the ListView items using data templates. Supports customizing each item by dynamic selection of the UI using a data template selector. Spacing - Specify the required space between items in the ListView for an elegant look and feel. Sizing - Customize the size of the header, footer, group header, and items in ListView. It is also possible to autofit them based on their content. Alternative row style - Apply alternating row style to the ListView items based on specific conditions for better data readability. Easy and flexible way to use all necessary properties and commands of Xamarin.Forms ListView in the MVVM approach. Pull-to-refresh and load more are also supported seamlessly in the MVVM pattern. Display a header view at the top of the control and footer view at the bottom of the control. Supports customizing the UI of both header and footer. Supports freezing and making it scrollable.